Whenever Cao Chong is damaged, he can show the top four cards of the deck. He then takes any combination of them so that the total of all the numbers is less than thirteen. Whenever another character is at the brink of death, Cao Chong can give them his entire hand (so long as he has at least one hand card) and flip his character card to allow that play to recover one unit of health. When Cao Chong activates "Weighing the Elephant," an Ace has a value of 1, a Jack has a value of 11, a Queen has a value of 12, and a King has a value of 13. Cao Chong has to keep the the sum of the cards he collects from "Weighing the Elephant" below 13. The sum cannot equal 13, meaning that he will never be able to take a King when using "Weigh the Elephant." Cao Chong must have at least one card in his hand to use "Benevolence." Cao Chong is prompted to use this abilityat the same time he is prompted to use a Peach to save a dying character. He can use a Peach and then give the remainder of his hand to the player on the brink of death to allow them to recover two units of health. Cao Chong seems to be an interesting character. He closely resembles Guo Jia. When Cao Chong activates "Weighing the Elephant," he typically gains two cards and can occasionally draw as many as three cards or as few as one. Unlike Guo Jia, Cao Chong can choose the cards that he can place in his hand. 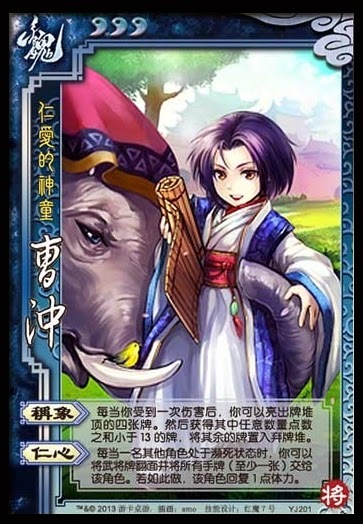 However, Cao Chong's "Weighing the Elephant" does not allow him to immediately share the cards he gains with teammates and the cards are not given to him face down. These are significant disadvantages relative to Guo Jia's ability, but "Benevolence" seems to be more useful than "Heaven's Envy." This ability seems to be particularly useful with Cao Pi, as Cao Chong can save Cao Pi with this ability then Cao Pi can flip him back over with "Exile" and provide him with more hand cards to use this ability again.